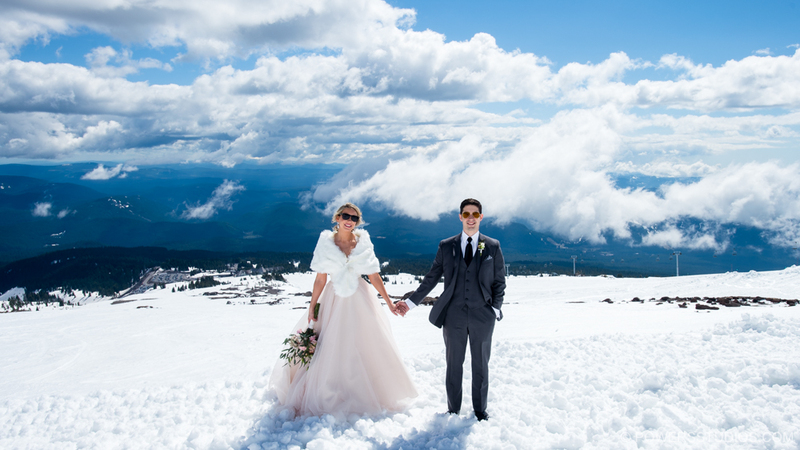 Ladies and Gentlemen, I present to you one of the prettiest weddings I’ve ever shot at Timberline Lodge. I couldn’t be happier for Taylor and Alex. They had so much fun throughout the day, their family and friends were awesome, the weather — fantastic. These two love the snow. They ski and snowboard, and Mt. Hood was happily in full attendance for the day. They had a touching ceremony in the Raven’s Nest, followed by a beautiful, naturally lit cocktail hour in the famous circular fireside lounge. Talk about an amazing experience for family and guests visiting from out of town. We took the smaller of the Lodge’s snowcats up the mountainside to Silcox Hut. We had blue skies, LOTS of sunlight and simply killer views. All the snow on the mountain acted like a giant reflector, providing the perfect lighting conditions for photos on the mountain. Taylor and Alex look radiant. The setting was epic. Also, big kudos to these two for hiking back into the snow after dark for some really fun star shots at the end of the night. Also there to help capture the day was the extremely talented video team from Candy Glass Productions. They are top notch, and it’s always a joy to work alongside them. The flow of the day was kept solidly on track by Leah of Northwest Premier Events. From keeping track of time, directing family, pinning boutonnieres to assisting in bustling Taylor’s dress, Leah was there. The day was so much fun and a pleasure to help document, truly an event to aspire to. Congratulations once again you two!